You have to hand it to the Maskers: they are up for anything, from Kafka’s Metamorphosis to home-grown Mistletoe Junction. 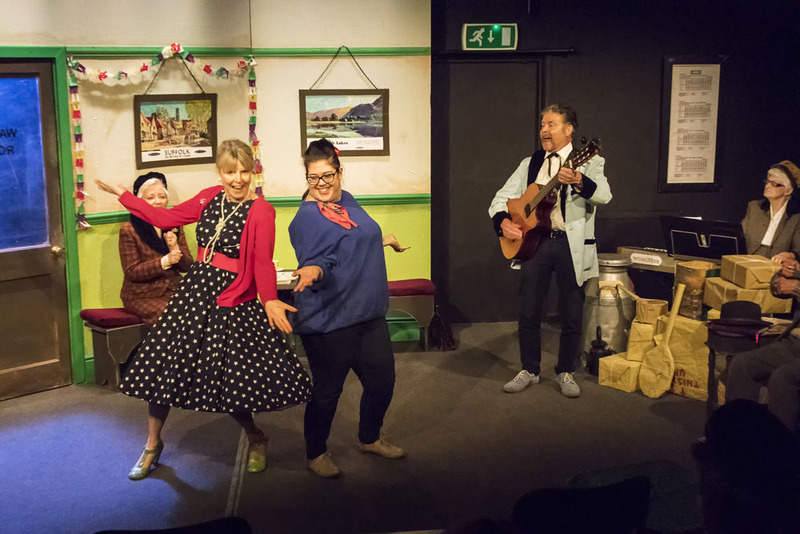 The latest production at their tiny studio theatre in Shirley is witness to both their variety of material and their unfailing consistency of commitment. This production is unashamed Christmas fare. Even the tickets come with the lure of mince pies and mulled wine. Ushers dressed in ’fifties costume show the audience to small tables seating four or so, covered with Christmas paper and gently glowing candles. The auditorium has in fact been transformed in two ways. 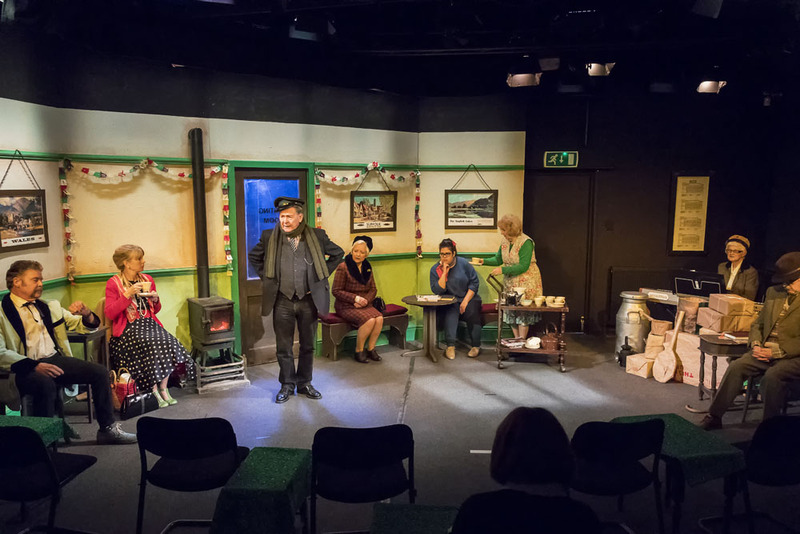 First, the audience are treated like a cabaret clientele and second, they look directly on to the interior of a railway waiting room, also decorated for Christmas with twinkly lights, ’fifties British Rail posters, a solid fuel stove and even milk churns in a corner. The plot, such as it is, revolves round the first character waiting for the London train, young Peggy, played charmingly by Bonnie Kaye. She is on her way to town for an audition at the Guildhall School of Music and Drama. 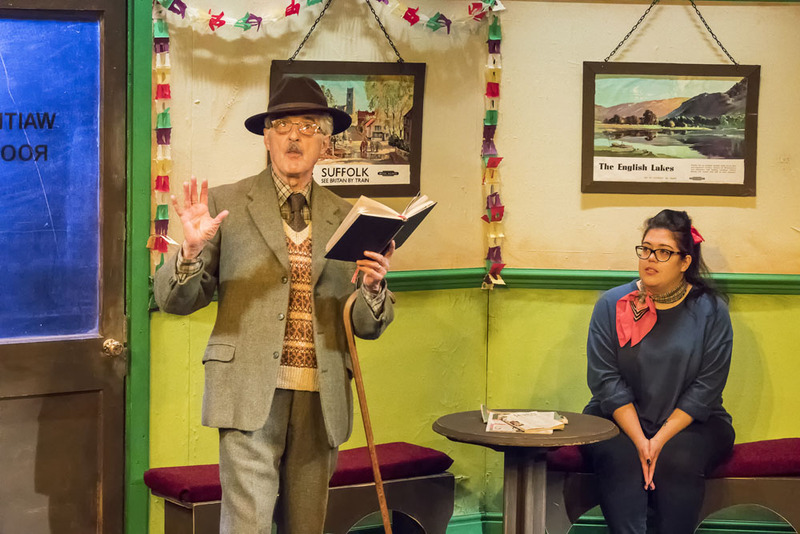 She rehearses her first piece, the poem ‘Christmas’ by John Betjeman, unaware that halfway through, Colonel Harvey Mainwaring, played by Philip DeGrouchy, has entered the room. He congratulates her on her recitation but on learning the reason for it, makes another suggestion for an audition piece, in this case, ‘The Three Kings’ by Longfellow, which he recites with classic oratory. This is the pattern for the rest of the production. One by one, different characters enter the waiting room and either sing or recite numbers from their own repertoire which they think may help Peggy select the best audition piece. There is a minor sub-plot in a delicate undeclared love interest between the Colonel and Celia, a genteel lady played by Jill Desborough, but predominately the plot is a vehicle for a wonderfully eclectic selection of Christmas-related material. In over thirty such numbers, you are bound to have a favourite or two, and probably some discoveries too. There are classics, such as Wind in the Willows and A Christmas Carol, but also some with a bleak reality, such as ‘Unseasonable comment from Mother Christmas’ and ‘We can be film stars’ by Sue Townsend. ’Fifties rock is delivered with real swing and rhythm by Shane (Eric Petterson), on his way with guitar and wife, Gwen (Marie Mc Dade), to a Bill Haley concert. Their teddy boy and girl costumes are spot on. Next are two behatted and gloved ladies on their way to town: Celia, as mentioned, and a piano teacher (Rosa Longman). The fact that a so-called Wurlitzer keyboard is discovered under wraps in the waiting room can only mean that our piano teacher can now accompany any song that is called for. Fortunate! No waiting room of the ’fifties is complete without a tea lady, of course, and the trolley is wheeled in by Beryl, played by Maire Allen. 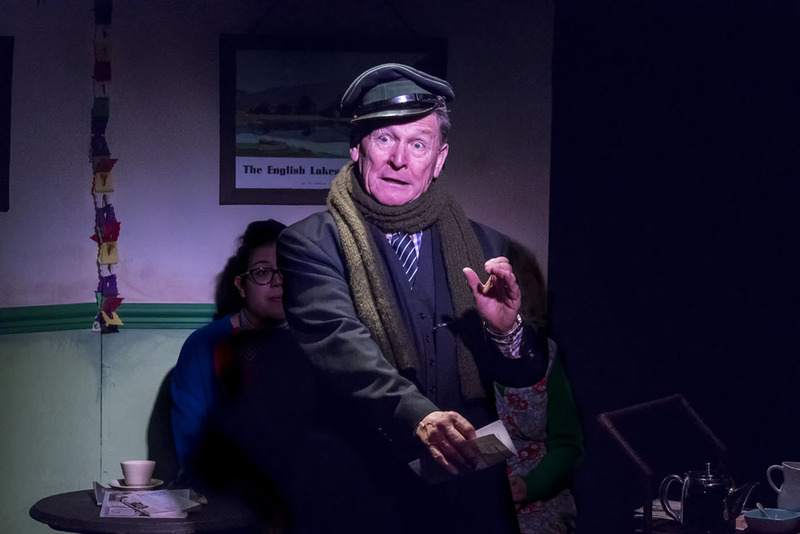 Last to join in the fun is the stationmaster, Sam (Brian Stansbridge), who just happens to have been the Colonel’s batman in the war – another fortunate event. By the time the waiting room empties to board the delayed train, all these characters are enjoying each other’s company and each other’s talents. As they leave however and the interval begins, you wonder, munching on your mince pie the while, how the second half can work. Ahh! It wasn’t their train at all. Cue for more numbers, more nostalgia as they pile back in to the waiting room. Now the songs, poems, dramas tumble one after the other, culminating in a selection of seasonal and groan-worthy jokes. Little pretence of following a plot line here but it really doesn’t matter. It comes therefore as little surprise that the evening ends with stage and audience singing together Christmas carols accompanied by the off-stage sound of the Salvation Army. Perfect! The production is sentimental but that is also its strength. Sometimes the poetry deliveries are rather ‘worthy’ and the singing slightly off-key. Hard to avoid, too, are Joyce Grenfell and Stanley Holloway impressions, but the overall feeling is very strongly goodwill on earth, peace to all men. It is warm, caring and positive and no-one wanted to leave at the end because the world outside the studio seemed far less inviting than that inside. Thank you for the escape, Maskers. And thank you, Brian and Angela Stansbridge , producers and directors, for your wonderful compilation. The programme for this amiable Christmas show does not include a script writing credit (though co Directors Brian and Angela Stansbridge do accept one as Production Managers), so one likes to assume that the cast helped develop the dialogue and choose the seasonal songs, poems and readings that make up the bulk of the evening's entertainment, with highlights including Philip DeGrouchy, as the theatrical and fruity voiced Col Harvey Mainwaring, on tremendous form giving a reading as Scrooge, Maire Allen, very playful as talented tealady Beryl singing 'Santa Baby', the lovely backing dancing and harmonies she performs with Marie McDade, Bonnie Kaye and Jill Desborough's Celia Johnsonesque character (under the piano and musical direction of Rosa Longman) to the rocking guitar and singing of Eric Petterson, and the warm hearted playing of Kaye as Bonnie, the drama student of a group sharing a train station wait one night in 1957. Christmas in 1957 - will the train arrive? The Maskers Christmas anthology will lift your spirits and push your nostalgia buttons. It is late December 1957 and the world is suddenly a very different place – the threat of nuclear war, Teddy Boys and, on the brighter side, television and Elvis Presley! 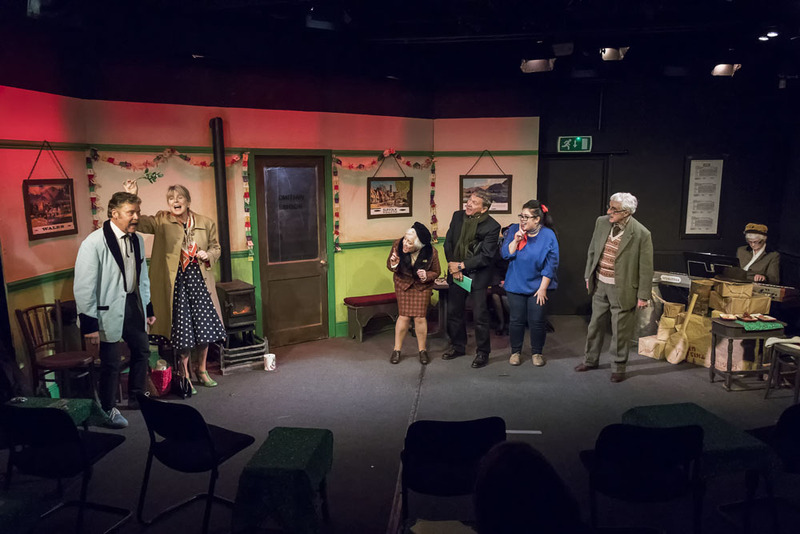 We invite you to sing along to some familiar and less familiar Christmas songs and laugh at the quirky tales and verse, all bound together with a collection of characters, each with their own story. Brian and Angela have been members of Maskers for over 40 years and have been involved in many productions – too many to list! 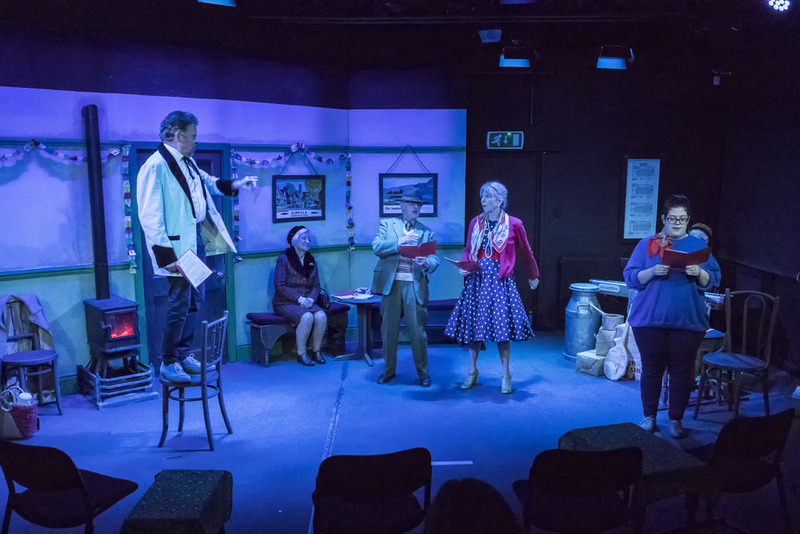 They have enjoyed ‘treading the boards’ whenever the opportunity arose, working behind the scenes with the technical and production teams, on costumes and sets, and generally helping out when needed. Brian has directed many plays, and acted in many more. 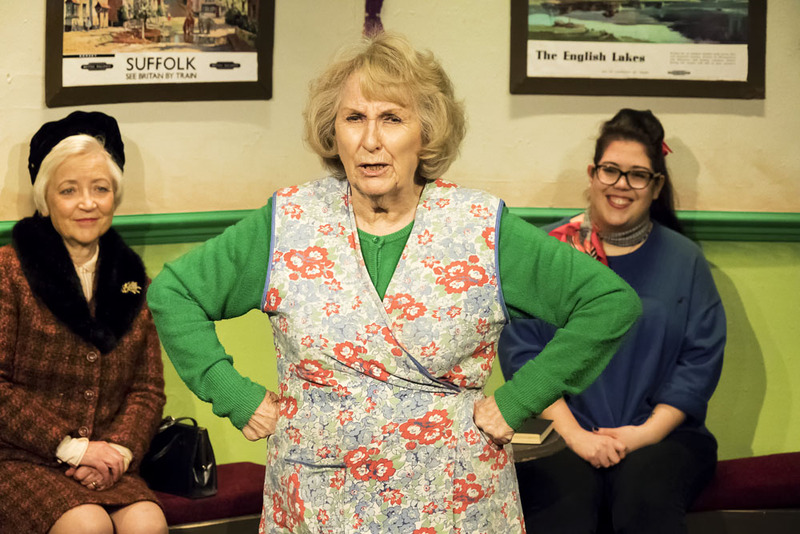 Angela played Philippa in Ayckbourn’s Ten Times Table earlier this year and is enjoying new the challenge of directing Mistletoe Junction. Both were involved in last year's Christmas show, Room at the Inn, and were so inspired by the vintage vibe, they had to come back for more! This is the first time Brian and Angela have directed a show together, and they assure us it has been an interesting and rewarding experience! 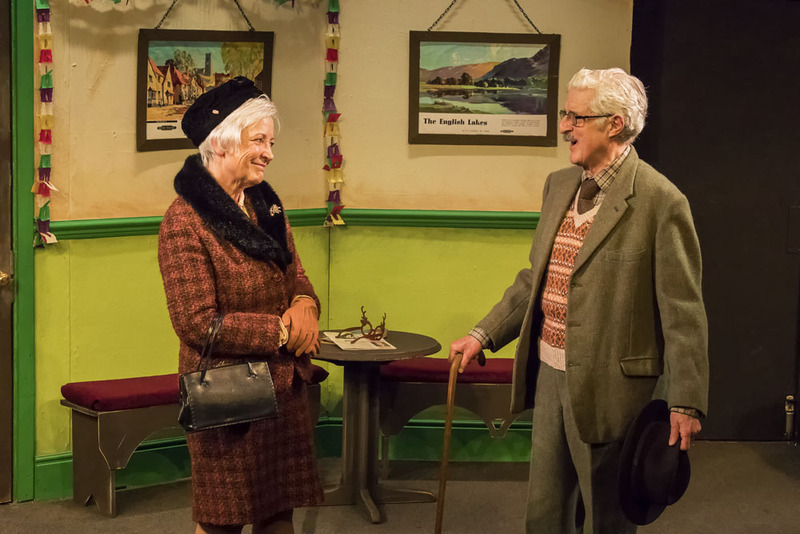 They are keen to welcome you into the Studio, saying "We hope you have enjoyed being transported back to 1957 – we have had a great time compiling the material and taking a step back to the dawn of pop music, remembering musty old station waiting rooms, cold winters and trains that don’t turn up on time!" So sit back, relax, and please have your tickets ready, as it's all aboard for this year's Maskers Christmas show. Since starting to play the piano at the age of 7 Rosa has been involved with music all her life. She also enjoys singing and has sung Alto in Southampton Choral Society for almost 30 years. As well as music she loves solving crosswords, taking part in and watching quiz programmes. Rosa is enjoying being part of the Maskers Christmas entertainers again this year. This is Bonnie’s debut with Maskers. As a member of the Nuffield Youth Theatre she appeared in The Great Gramboolian Plain, Skellig, The Red Red Shoes, and Metamorphosis, as well as working on improvised pieces. She is enjoying being part of the Maskers Christmas Team giving her a chance to enjoy her love of singing, dancing and literature. Marie has been a Masker now for five years and has appeared in a wide range of productions, from Shakespeare to Ayckbourn and back again. This is her second Christmas Show and she has loved getting back into the spirit of the 50’s. Rock and Roll! Eric started a late acting and singing career with A Christmas Charivari in 2012. He also performed in the Christmas shows in 2013 and 2014. His straight acting roles have included the Guard in Forward to the Right and Jack in The Weir. He played Gaunt in a touring version of Richard II and had a hobby of picking up young ladies in The Yalta Game. He really enjoyed last year’s Christmas show and is enthusiastic about Mistletoe Junction. This is Jill's sixth show since joining Maskers just over two years ago. These have included a touring production of Richard II and two outdoor summer shows. She has enjoyed all of them. Her first show for Maskers was Christmas is A-Comin' in 2014, so she is particularly delighted to take part in this year's Christmas Show. She has had fun helping to devise the character of Celia, drawing in part on the experiences of her own grandmother, and this has been a lovely group to get into the Christmas spirit with! Maire has been a Masker for 13 years, appearing in The Merry Wives of Windsor and as a drunken housekeeper in When We Are Married. She worked onstage professionally in her teens and twenties. 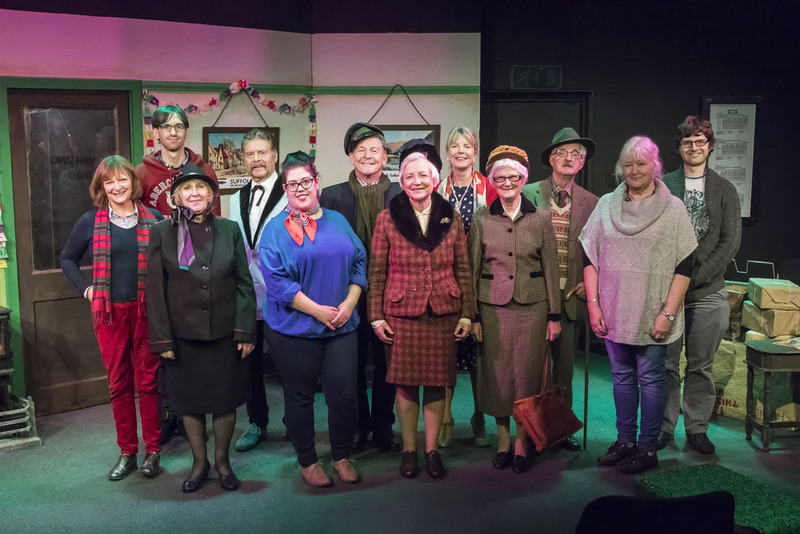 As a director, Maire has brought Jingle Bells, Cheek, The Gentle Hook and Her Tongue to the Maskers Studio and Totton Festival and in 2008 she directed An Ideal Husband at the Nuffield Theatre. Now Maire is enjoying pushing a tea trolley in Mistletoe Junction! 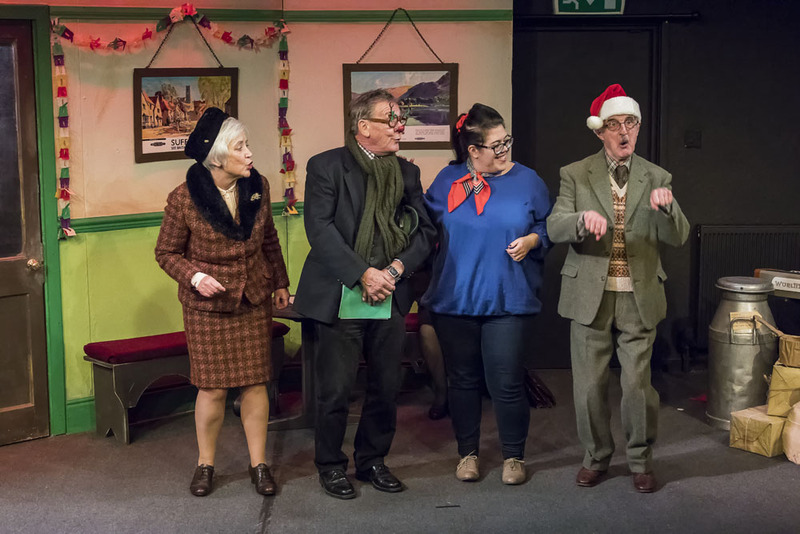 Brian Stansbridge has been a member of the Maskers for over 40 years, acting in many productions and directing quite a few, including last year’s Christmas show Room at the Inn (co-directing with Sheana Carrington). His last planned acting role was as Long John Silver in Treasure Island, but the performance which probably gave him his greatest buzz was taking over a major part on the last night of this year’s Nuffield show, Ten Times Table with half a day’s notice, when the Masker playing the part lost his voice!! Theatre and bar open from 6:45pm, Performances start at 7:30pm, ends approximately at 10pm, includes an interval. Click on the images to display them in full size. Your message has been sent. You should receive a confirmation email shortly. If the email does not arrive it is possible that your email address was not entered correctly, please try resubmitting your enquiry. Please use this contact form for contacting us about any issue. Use the drop-down list to ensure your enquiry gets directed to the correct person. Any contact details provided will only be used in relation to your inquiry and will be deleted after conclusion. Are you a member of Maskers Theatre Company? You can change your mind at any time by clicking the unsubscribe link in the footer of any email you receive from us, or by contacting us at marketing@maskers.org.uk. We will treat your information with respect. For more information about our privacy practices please visit our website maskers.org.uk/subscribe.php By clicking below, you agree that we may process your information in accordance with these terms.